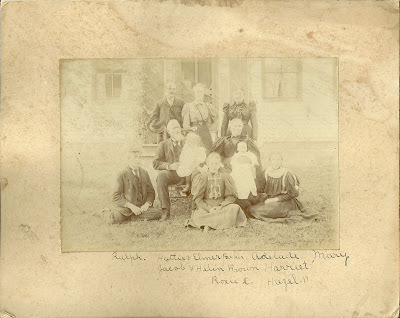 Wonderful family photograph; no photographer's imprint to give a clue to locale. Possibly Maine or New England, but could be from anywhere. Someone has handwritten identifications at the bottom of the photograph; surnames are Parker and Brown. I tried searching online to tie these folks together and perhaps come up with the proper extended family, if that is indeed what this photograph represents. No luck so far, so I'm hoping that a reader will recognize these names from family research and enlighten me. Please scroll down to the comments section or contact me directly if you can help. Thanks for stopping by!